For information about the Orange Mountains Commissioner's staff, please contact our District Commissioner . The Unit Commissioner probably has one of the most important roles on the unit service team. He/she must be the friend, counselor and mentor to unit leaders while operating quietly in the background. His/her primary tool is persuasion, when it is necessary to recommend changes. This means that a Unit Commissioner needs to be a "people" person, a team player, one who fulfills promises, a believer in the ideals of Scouting, adaptable, and enthusiastic. 1. Maintain a close liaison with the chartered organizations and units they serve. 2. Work to assure effective and active committees. 3. Encourage unit personnel to participate in Roundtables. 4. Establish good lines of communication between unit personnel and District leaders. 5. Help select and recruit unit leaders. 6. Be constantly alert to falling into the trap of doing everything except his/her job; e.g. running FOS campaigns. The UC's job is unit service! 7. Cultivate and maintain the best possible ongoing relationship with the unit leader. This is probably the most important role of all! c. A few pointers 1] The unit leaders are your peers - don't talk down to them. 2] You are a coach - don't dominate. 3] It's not your unit - don't try to take it over. 4] Help the unit discover solutions - don't act like an expert. 5] Look for opportunities - don't always find problems. 6] Blame processes and systems - don't blame or criticize unit leaders personally 7] Be persistent - don't walk away and do nothing 8] Support Scouting - don't take it out on the leaders or boys 9] Do what you said you would do - and when you said you would do it. 10] Keep your promises. 11] Model the appropriate behavior - don't allow your actions to contradict your words. 8. Constantly evaluate the success of the unit in providing a quality program and communicating the status of the unit to the ADC. Unit Commissioners should use the "Unit Commissioner Work Sheet (Pack)", "Unit Commissioner Work Sheet (Troop)", and "Unit Commissioner Work Sheet (Crew)" to review the status of each unit. Each work sheet has dozens of helpful suggestions on helping the units to do a better job. Use judgment as to when it is appropriate to offer recommendations. These work sheets are available in the back of your Commissioner Fieldbook and may be reproduced as needed. What Is the Commissioner Service? How Is It Organized? Youth experience Scouting in Packs, Troops, Crews, Teams, and Posts. The healthier the unit, the more wonderful things will happen for these youth involved in Scouting. To help make this occur, the Boys Scouts of America provides a program of unit service through adult Scouters specifically commissioned to help chartered organizations and unit leaders to achieve the aims of Scouting by using the methods of Scouting. 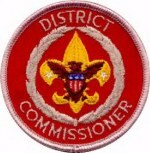 These commissioned Scouters wear a shoulder patch with a wreath surrounding the Scout symbol. 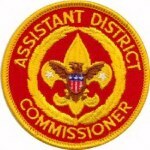 The Commissioner Service is the organization within Scouting that provides a program of unit service. Because of the importance of unit service to the successful delivery of the Scouting program, you will find Commissioners at every level of Scouting. And all of these Commissioners are there as a team to help assure that individual Scouts get the best possible program. This includes the District Commissioner and the Assistant District Commissioners. Their primary responsibilities are recruiting, training, guiding, and evaluating the Commissioner staff. In larger Districts you may find that their are line managers and specialty advisors within the Commissioner staff. For example you may have Assistant District Commissioners that manage several Unit Commissioners in a Service Area and others that specialize in rechartering, training, or the administration of the Commissioner service. Unit Commissioners are assigned to one or more units, which they serve and counsel. In some Councils and Districts, Exploring units are served by Unit Commissioners and in others by Exploring service team members. What Are It's Purposes and Goals? The Commissioner Service exists to help units provide the best possible Scouting program, which ultimately helps assure that individual Scouts have the best opportunity of developing good character traits, participating citizenship skills, and personal fitness. 1. Help see that the objectives of Scouting are being carried out. 2. Assure that each unit has strong, competent unit leadership. 3. Promote regular meetings of unit committees. 6. Foster a positive relationship between the chartered organization and its unit leaders. This unit service program is invaluable to both the chartered organizations and the local Council when it is thoroughly understood and wisely administered. This means a commitment to EXCEPTIONAL customer service! I hope the above article has made you a little wiser about the commissioner service, and now I have a request for you. If you know anyone who was an ex-scouter, who would like to involved but doesn't have children in scouting directly anymore, or anyone who is just interested to be in scouting, and would like to volunteer to be on the commissioner staff, please contact Ken Fineran.